It was school on Sunday for Minister for Jobs, Enterprise and Innovation Mary Mitchell O’ Connor at the national school she attended as a child in Belmont, Milltown. Mary’s mother Kathleen, a former principal, was there when the recently appointed Minister visited her alma mater. Large crowds of pupils past and present, parents, teacher, other staff, neighbours and other well wishes were present for what was a triumphant homecoming for Mary, whose parents are Kathleen and Paddy from nearby Emeracly. 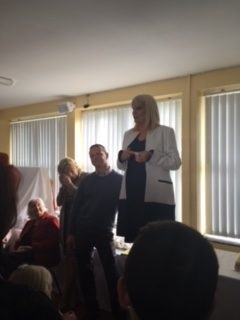 Earlier Minister Mary had attended Mass in Milltown where she also met many others from the wider community who were there to congratulate her on being selected as a Government Minister. She spoke fondly of her school days in Belmont and shared many memories with her classmates. She also had a laugh looking at her absenteeism in the roll book before making a speech and having her picture taken with the pupils, parents, staff and others who attended the gathering. Principle Eleanor Sheridan said it was a very historic day for the school and she also said it was an inspirational event for everyone. “There was a really warm friendly atmosphere with all shades of political opinion and none present and the new Minister said that the rough and tumble playing football in the school yard at Belmont and walking home in the evenings prepared her for the rough and tumble of politics,” says the principle. “The new Minister was also very positive in her comments on small schools and she also emphasised that she is a ‘West of Ireland girl’ and she will never forget that,” added Eleanor. She was the replacement principle in the school when Minister O’Connor’s mother retired in 1994. On Sunday presentations of bouquets of flowers were made to the both the Minister and her mother Kathleen by present pupils at the school. This page was added on 06/06/2016.